Company specialising in the manufacturing of coffins: We offer an extensive range of funeral coffins meticulously adapted to the requirements and specifications of any funeral home. Eco-friendly, wooden or MDF coffins with a selection of models and special measurements. Because quality is compatible with price: Our product offers the best warranties on the market on top of a quick and efficient turnaround time, all with unbeatable prices. Commitment to social and environmental sustainability: Our eco-friendly coffins are certified with the AENOR Product and Environment 'N Mark' according to standard UNE-190001:2013. Our production is also 100% Spanish-based and accredited by IBERATAUD. 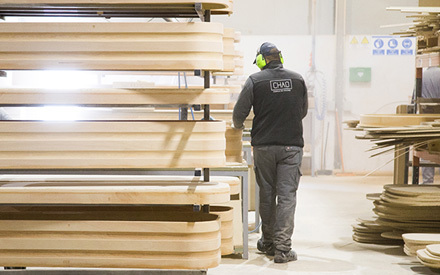 CHAO is the benchmark in the manufacturing and sale of coffins in Spain since 1910, whilst constantly aiming to offer the best service and quality to its clients. With a constructivist philosophy, the company stay on top of the changes and developments experienced by the sector. Our new Customer Service Department allows us to identify and understand your demands through direct communication, adapting our production in order to quickly and effectively meet your needs and expectations. We aim to strike a balance between the economic, environmental and social sectors. Among our objectives we strive to minimise the environmental impact of our production. This explains why we are the first coffin manufacturer to certify our ecological products according to Standard UNE-EN-ISO14001:2004. In addition to the funeral chests of the catalog we have many other models of coffins and our factory is adapted, depending on the needs of our customers, for the production of new designs or specifications.